We’ll look at appraisal and grading documents that are under dispute or doubted. 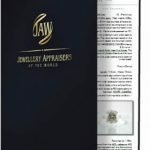 With our years of experience and substantial time spent teaching appraising to fellow gemologists, we are qualified to render opinions on the appraisal products of fellow professional appraisers when the need arises. How and when did my diamond break? Was there inherent vice? Was my ring made improperly? What happened to the color of my emerald? Click the image below to open a sample Atlas appraisal report.